We provide the platform for your player to step up their game and advance and succeed in soccer. A player’s curiosity and learning of the beautiful game of soccer may start with experience in our Micro or Rec League, a family tradition, a gym class or one of our summer camps. As a young athlete takes in their life experiences, soccer may become one of their peak interests in organized sports. There is no substitute for practice, hard work, determination and proper coaching for a player advancing in soccer. We guide our young soccer interested players, 8 to 10-year-olds, to take their playing to the next level by enrolling in our Academy program. In Academy, our players have the experiences and opportunities to develop their skill sets and game awareness in helping them decide if soccer is their game. 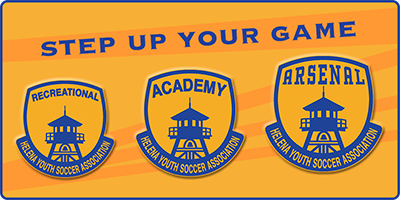 The next level for an Academy player as they become age 11 and older is our Arsenal program, our players progress with a love for the game and are motivated to perform as a team. Arsenal players continually step up and improve their own skill sets for competition on the pitch. The Arsenal program provides an outstanding opportunity for our trained athletes with highly competitive matches against teams throughout Montana and the western United States. Learn more below about how our programs help your player step up their game.